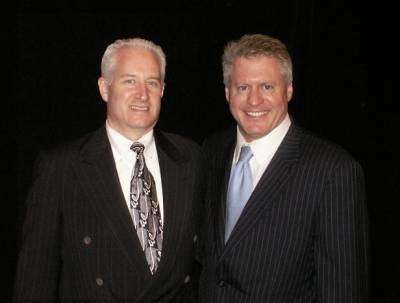 Richard C. Randall with the original “Capitalist Evangelical”, Wayne Allyn Root, during May, 2008. During 2017 Wayne began hosting his own radio show "The Wayne Allyn Root Show" on USA Radio, and shortly thereafter, his own TV show "The Wayne Allyn Root Show" on Newsmax TV. Originally from Toccoa, GA, Richard C. Randall comes from a family of entrepreneurs; and he is passionate about helping businesses succeed. After graduating with honors from “North Georgia Technical College”, where he earned a degree in “Electronic Technology”, he accepted a position with General Electric Co. and re-located to Norcross, Georgia (a suburb of Atlanta). Upon being promoted to the position of “National Quality Manager”, overseeing 20 GE Electronic Services calibration and repair centers, Randall directed all of these facilities through ISO 9002:1987 registration by NQA-USA (an international Quality Management Systems Registrar). Randall left General Electric, Co. in May, 1993, accepting the position of “Southeast Regional Director” for NQA-USA. In August of 1995, he left NQA-USA to form his own business offering quality systems auditing and quality management consulting services. Initially a IRCA certified “QMS 2008 Principal Auditor” (Certification No.A005891), Randall is now a Probitas Authentication certified “Aerospace Auditor”. Certification Number: 1619032756 (previously an Exemplar Global Certified “AS9100 Aerospace Auditor” (Certification No. 110366)), Richard C. Randall has performed over 2,000 quality management system audits for such world class registrars as ABS Quality Evaluations, Intertek, NQA-USA, Platinum Registration, Perry Johnson Registrars, Smithers Quality Assessments, STR-R/UL & VCA North America. Utilizing his experience in the metrology (calibration) industry, Randall has also performed ISO 17025 Calibration Laboratory Accreditation audits for A2LA (American Association for Laboratory Accreditation) and ACLASS/ANAB (Assured Calibration Laboratory Accreditation Select Services). In addition, Randall has also performed ISO 17020 Inspection Body audits for ACLASS/ANAB. Randall built upon the base of experience he gained through working at General Electric Co., by performing quality management system audits at such well known companies as: Berry Plastics, BioRad Laboratories, Boeing, Canon, EcoLab, ERA, Fluke, General Dynamics, Gichner Shelter Systems, Gilbarco, Good Earth Tools, Graybar, Lambda Electronics, Landoll Corp., Limitorque, Lockheed Martin, Meggitt Defense Systems, Munters Corp., NASA (JSC-RITF), Parker-Hannifin, Primus Aerospace, Raytheon, R.R. Donnelly, Sanmina, SGS - Agriculture, SGS - Oil, Gas and Chemicals Services, Spirit AeroSystems, and UniGroup, Inc.
As a quality management system consultant, some of Randall's clients have included: Almo Corp. (Largest national distributor of Major Appliances, Premium Appliances, Consumer Electronics, and Professional A/V equipment), American Cargo Assurance, Bell Microproducts (acquired in 2010 by Avnet, Inc.), Electro Rent Corp. (the world's largest computer rental/lease company), Eurofins Central Analytical Laboratory, ICQ Global, Inc. (acquired by UL in 2012), Intertek Testing, Micro Typing Systems, Inc., Network Global Logistics, Precision Metal Manufacturing, R&G Laboratories, Inc., Russell Marine Group, Thionville, and TradeMark Computer Systems (a division of Bell Microproducts). And as a testament to the effectiveness of creating self-sustaining systems, during 2016, Randall overcame neck cancer while continuing to operate his business.